Drumdrops has released The Vintage Funk & Disco Dual Kit Kontakt Player Pack. It contains both the Vintage Disco Kit and the Vintage Funk Kit. 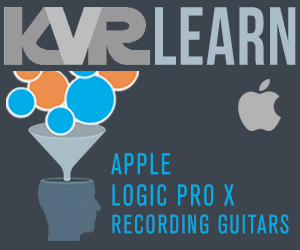 This pack makes the kits completely compatible with the free Kontakt Player sampler. The instruments included are fully NKS compliant. The two kits included in this pack were both recorded by Drumdrops head honcho Mike Pelanconi at the Ironworks in Brighton, UK. Mike better known under his record name Prince Fatty, is a British sound engineer and record producer. He has worked with a diverse repertoire of artists and producers from Acid Jazz and Delicious Vinyl to Lily Allen, Manu Chao and Graham Coxon (Blur). The Vintage Disco Kit was recorded with a late 70s sound in mind, in a nice tight recording room. For Drumdrops it means a fat low end from the kick but with a little high end bite to cut through the four to the floor groove, a warm and rich snare to keep that beat focused that of course tonally mixes with the clap. Fast sounding 15 inch hi hats for a classy open hi hat sound. All Toms low and dead ready for the supersonic fills and breakdowns necessary to hype the dance floor into a frenzy. Sister Sledge at your disposal. Remo ebony ambassador and evans hydraulic heads to create the disco sound. Gaffer taped, damped with dustcloths, tuned low and dead the disco sound is finally captured. Bonus cowbells, cabassa and tambourine and electronic analogue clap trap recorded for your breakdown pleasure. The vintage Disco kit was recorded using a 70s Rogers Big R Kit, tuned for the disco sound. It comprises a 24" x 14" Bass Drum, a Sonor Sonorlite 14" x 6.5" and Sonor Maple 14" x 7" Snare Drum, a huge 18" x 16" Floor Tom, and two Rack Toms, a 14" x 10" and a 13" x 8". The cymbals used were 15" HHX X-Celerator Hi-Hats, a 17" Zildjian K Dark, an 18" Sabian HH extra thin Crash and a 20" Sabian Artisan Ride. The Vintage Funk Kit was recorded with a 70s funk sound in mind in the same tight recording room as the disco kit. With the help of Jan Kincaid (Brand New Heavies) Drumdrops sampled his Sonor Hi Lite Drum Kit with a mixture of vintage cymbals and some bonus percussion. The kit was tuned for a 70s Funk sound. So dig out your wah wah pedal bring out the platform boots and build some funk tunes with this kit. The vintage Funk kit was created on a Sonor Hilite Kit which was tuned for the funk sound. It comprises a 22" x 14" Bass Drum, a Sonor Sonorlite 14" x 6.5" Snare Drum, a Sonor Horst Link 14" x 5" Snare, a 16" x 16" Sonor HiLite Floor Tom, and two Hilite Rack Toms, a 12" x 9" and a 10" x 8". The cymbals used were Zildjian 14" New Beat Hi-Hats, a Bosphorous Master Series 18" Crash, an 18" Sabian HHX Legacy Crash and a 20" Zildjian K Custom Dark Ride. Percussion for this kit includes cowbells, tambourines and a shaker. Drumdrops have also included some samples from the digital Clap Trap. Everything you need for a 70s Funk kit. New mixer design with routing to DAW, 4 Aux Sends (2 reverbs and 2 delays). New Channel Effects - EQ, Compressor, Shape, Tape Control. Mic Mix section to mix together the close mics, overheads & rooms on both Kits. Drum Voice - edit the attack, hold, decay and tuning on each drum. Humanize - Randomly change the volume, velocity, tuning & timing of hits. New Master Effects Compressor, Limiter, EQ and Crush section. Stereo width control and L/R swap. Improved MIDI groove player now with 2594 loops (110 Funk loops / 194 Disco Loops). New MIDI Map section for easily building and saving your own Maps. MIDI CC Editing Page - Edit the parameters controlling the snare, hi-hat and cymbals. Many Snapshot presets included mixed by different engineers in both kits. Over 16000 samples on each kit recorded in 24 velocity step and 5 round robins. For more details on the Vintage Disco Kit Kontakt Pack head here. For more information on the Vintage Funk kit Kontakt Pack head here. The Vintage Funk & Disco Dual Kit Kontakt Player pack can be purchased direct from the Drumdrops website for £ 90.00 here. 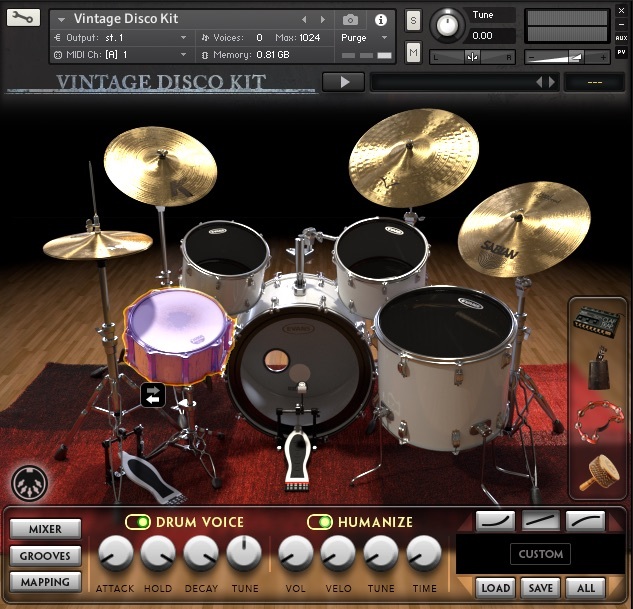 The Vintage Disco & Funk Dual Kit Kontakt Player pack can be purchased direct from the Drumdrops website for £90.00. For a limited period customers can get a 30% discount. Use the voucher code discofunk30 at checkout. For customers who have previously purchased the Vintage Disco Kit Kontakt 5 Pack they can upgrade to the Kontakt Player pack for £35.00. Use the voucher code discokU at checkout. 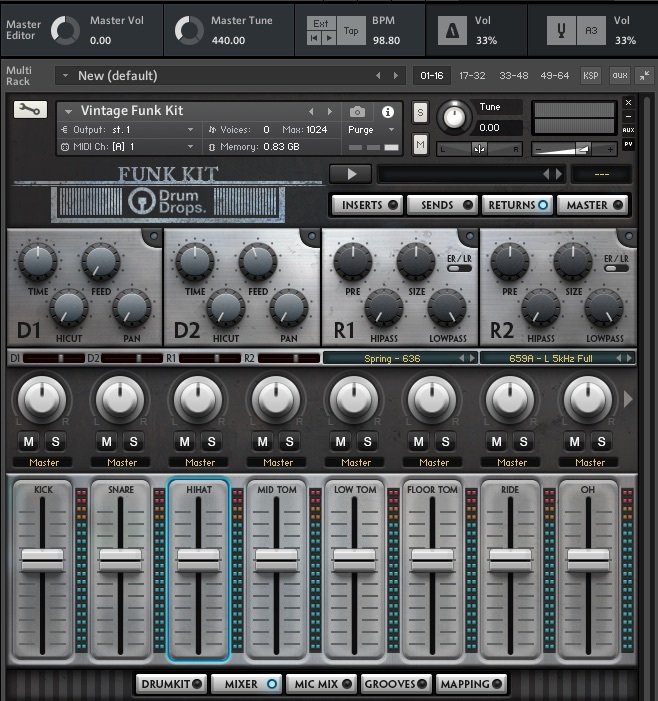 Also released is the Vintage Funk Kit Kontakt 5 pack which is compatible with the full latest version of Kontakt 5. 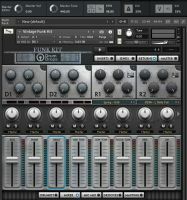 This pack contains all the features of the instrument found in the Kontakt Player pack except for the NKS compatibility. This pack is available to purchase from the Drumdrops store for £45.00. For a limited period customers can purchase this pack for 20% off using the voucher code funkkontakt20. Sound EX Machina releases "Graffiti Spray Paint"
Y'all seem to be mixing up "funk" and "folk" throughout this article, including the headline. 08 May 2017Drumdrops releases "Folk Rock Dual Kit Kontakt Player Pack"